When you spend a couple of decades watching the world of fitness and strength training you see a lot of strange things. Often you see the same strange things repeatedly.One of the things that happens like clockwork is a Hollywood movie featuring somebody in great physical shape who has his shirt off for several minutes of screen time – and the inevitable publicity for the ‘workout’ that made it all possible. Movies like 300 or The Wolverine or a dozen others, TV shows with actors likeTrue Blood’s Joe Manganiello, who has a great physique, all give rise the the inevitable magazine and web articles that feature “The Workout” used by the celebrity. The idea is fostered that if you only had the Secret Workout of the celebrity you could have the same fantastic physique displayed by him. Here’s the truth: There Is No Secret Workout. The reality is virtually any workout can work to some degree and every workout – without exception – can utterly fail. 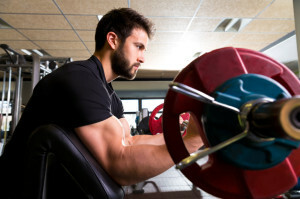 There is also no secret technique like doing biceps curls on a colorful Swiss ball, or twisting your wrist at the top a a curl or flexing your shoulders at the top of a deadlift. All of these alleged benefits can be thwarted simply by stupid workout planning. Put three guys in a gym and one of them will swear three sets of 10 to 12 reps to failure is the secret workout of champions. Another will say it’s one very slow set to failure. Another – bless him – will say it’s timed sets of strong range reps.
And guess what? All of them could make good progress or all of them could fall on their face. You can lift cinder blocks in your back yard and build some muscle. You can break rocks with a sledgehammer and build some muscle. You can lift sub-maximum weights and gain some muscle. You can also do all of the above and overtrain and dig yourself into a metabolic hole where you get sick and/or lose the motivation to do any exercise at all. The reason any potentially productive workout can fail is because people train blindly with it. It doesn’t matter if it’s a celebrity workout, a pro bodybuilder workout or a workout I created just for for you – you can overtrain or undertrain with it and get absolutely nowhere. In fact, you can make your overall health worse, not better. c) What is you plan to generate higher intensity on your next workout? ALL of that is determined outside of the gym! There is no excuse for working blind. It’s just dumb. And needless. Take basic measurements of your intensity and then make sure that intensity increases on every exercise during every workout. Don’t turn a good workout into a bad workout by not planning it properly.